In this Cheddar Review by A2X Accounting, we asked A2X who they are, what they like about Cheddar, and advice to others starting out. A2X is a software service developed by ExportX. ExportX is a multichannel e-commerce company selling online since 2008. Naturally, as they expanded, ExportX decided to begin selling their products on the e-commerce behemoth Amazon. Amazon’s sales reporting includes sending flat file reports that would show net profit but exclude things like sales, fees, shipping, and so on. The files also included timeframes that would overlap months and it wasn’t clear which revenue came from which time period. The team quickly discovered that Amazon’s flat files made it incredibly difficult to reconcile payments. They spent countless painful hours doing accounting on their backend manually reconciling the data returned by Amazon. So, ExportX decided to solve the company’s own accounting problem and built the software that would later become A2X. While actively participating on forums with other Amazon sellers, they noticed a trend – they weren’t the only ones with the same challenge of Amazon payments reconciliation. They realized that they could help others as well and discovered a need to productize. The first prototype of A2X launched in 2014. Officially, the Amazon accounting software launched in 2015. Since launch, A2X has helped over 1,500 Amazon sellers with their accounting. A2X integrates seamlessly with cloud accounting software Xero and QuickBooks Online. Early in development, A2X made strong relationships with leading ecommerce accounting specialists in the US and UK whose clients loved A2X and their focus in Amazon accounting. 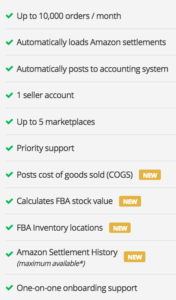 Now, A2X is an invaluable asset for Amazon accountants looking to help Amazon sellers reconcile payments and see accurate financial information. Starting out, A2X was looking for a solution that was inexpensive, scalable, and easy to implement. At the time, payment processing options for New Zealand merchants were limited. As a small SaaS startup, they had limited developer resources to commit to integrating and maintaining a billing solution. Initially, A2X decided to use PayPal to manage billing because they could set up subscriptions in minutes, but soon discovered that PayPal doesn’t offer the kind of billing logic they needed. Even subscription actions as simple as a plan changes were beyond PayPal’s scope.They realized they needed different pricing plan tiers, more control, and more flexibility. After deciding to make the move from PayPal, A2X needed a new billing solution fast. They evaluated a variety of options and decided to go with Cheddar. Cheddar was the only option that allowed them to continue using PayPal for payment processing, but offered better billing and subscription management features and offered built-in hosted pages so they could start processing transactions right away. The best part was Cheddar’s transparent pricing of a flat fee and fixed percent that made it easy to calculate the value of Cheddar as they scaled. After getting started with Cheddar, Braintree, a payment processor, became available in A2X’s home country of New Zealand. They realized Braintree offered better rates than PayPal as well as direct card processing. 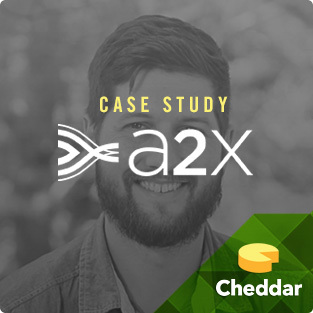 Since Cheddar was already compatible with Braintree, A2X was able to take advantage of this new processing option by simply connecting a Braintree account to their existing Cheddar product. A2X still uses PayPal, as well as Braintree, to offer more payment options for customers. When launching, A2X chose a price as an experiment just to see if there was interest. As they got to better understand their users and gathered more usage data, they saw a natural tiering of customers. 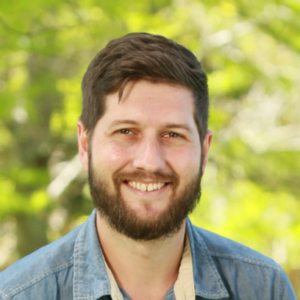 This customer data fueled their next iterations of pricing. 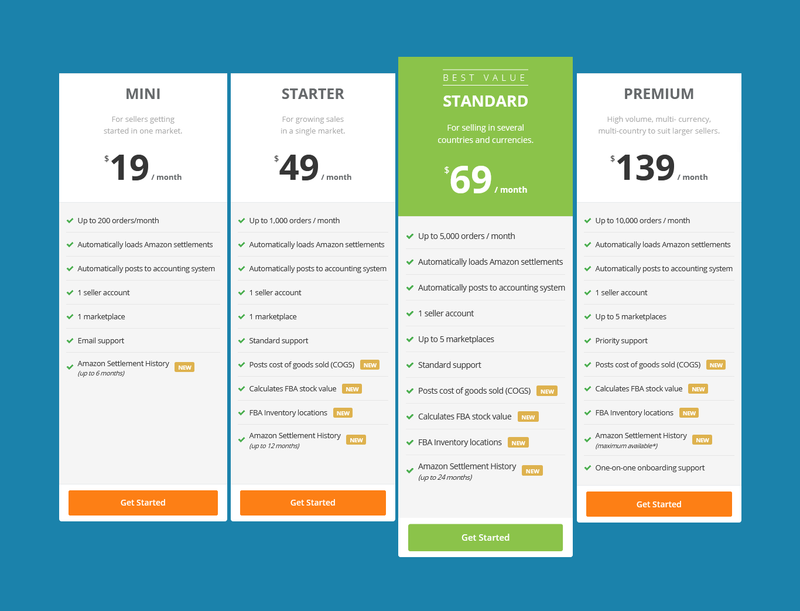 A2X pricing tiers are based on their value metric of number of orders per month. Additionally, they offer 1-5 marketplaces in tiered plans. Naturally, for Amazon accounting, the number of orders means an increase in complexity. What does A2X like Best about Cheddar? Very simply, Cheddar gives you the ability to get started quickly, at a price point that offers great value, and allows the ability to scale with other payment systems. A2X leveraged hosted payment pages to get up and running. They liked the ability to launch a simple payment page very quickly, but also that Cheddar provides a flexible API they can use with their own payment pages in the future if they’d like a higher degree of customization. Cheddar’s pricing model offers great value at a great cost. Subscription fee plus a flat $0.30 cents per transaction if you bring your own payment processor (otherwise 2.9% + $.30) and Cheddar doesn’t charge hidden fees or percentages as you scale. Cheddar has a built-in payment processor, called CheddarPay, which allows you an instant merchant processing account. However, Cheddar doesn’t limit you – it allows you to bring in any payment processor of your choice, like Stripe, Braintree, etc. Having payment processor integration options allowed A2X to scale with flexibility. A2X loves Cheddar webhooks and integrates with them to create data-rich dashboards for their business. 1. Solve a problem that exists. Don’t spend 6 months building something that might never work. Start by knowing that you can find customers. 2. Pick the things you want to spend development time on. Developers often want to build their own solutions, but underestimate the time and effort they’ll need to put in to building functionality that is outside of their product’s core value. If you’re interested in Amazon accounting software, A2X Accounting is best in the industry. 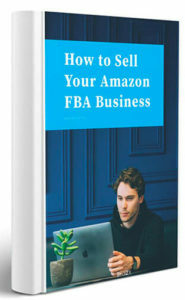 Expert Amazon sellers and creators of accounting software for Amazon, A2X has just released their new ebook How to Value and Sell Your Amazon FBA. Senior software engineer Ashley Schroder leads the development of the advanced e-commerce software technology that underpins ExportX automated operations. His innovations include A2X for automated Amazon accounting integration, and OrderPipe, a free service for suppliers that lets them track stock levels and monitor their sales milestones in export markets day by day and hour by hour on a mobile device or web browser. Ashley is prominent in the Magento e-commerce software community, he blogs at aschroder.com and speaks at conferences in America and Europe on aspects of e-commerce software development.